I have always associated Easter with an early Easter Sunday morning in 1996, the moment I discovered that my mother was facing death. Life was never the same at home. My mother lived for another 6 months but that day has forever cast a shadow on my relationship with Easter. This year I decided to free associate. In the process of exploring the many aspects of Easter I soon realised that a lot of mysteries shroud this time of death, rebirth and resurrection. And there is somehow comfort in the mystery. My travels through time have unearthed stories about the lunar and solar cycles, goddesses, shapeshifters, labyrinths, hares and the Otherworld. It seems Easter transcends and includes the passions of Christ, Passover, The Copernican Revolution and The Space Age. The calendar dates of Easter involve algorithmic plot lines dramatic enough to fuel a Mexican soap opera. This adventure has taken me to the moon and back, which reminds me to remind you to check out our next Moon Medicine Gathering at The Chapel of Ease on April 18. It will be lit. Where the word ‘Easter’ comes from is still debated, but it appears to have sprung from a combination of the Greek goddess of fertility, Ēostre or Ostara, and the Sumerian goddess, Ishtar who was hung naked on a stake, and was subsequently resurrected and ascended from the underworld. The word East is also derived from her names, as is Oestrogen, the female hormone. Ostara was observed through feasts and celebrations involving coloured eggs, rabbits, chicks, and flowers. The emphasis of the Sabbat was on rebirth and renewal and so the symbol of the egg was of particular importance as was the concept of the labyrinth. 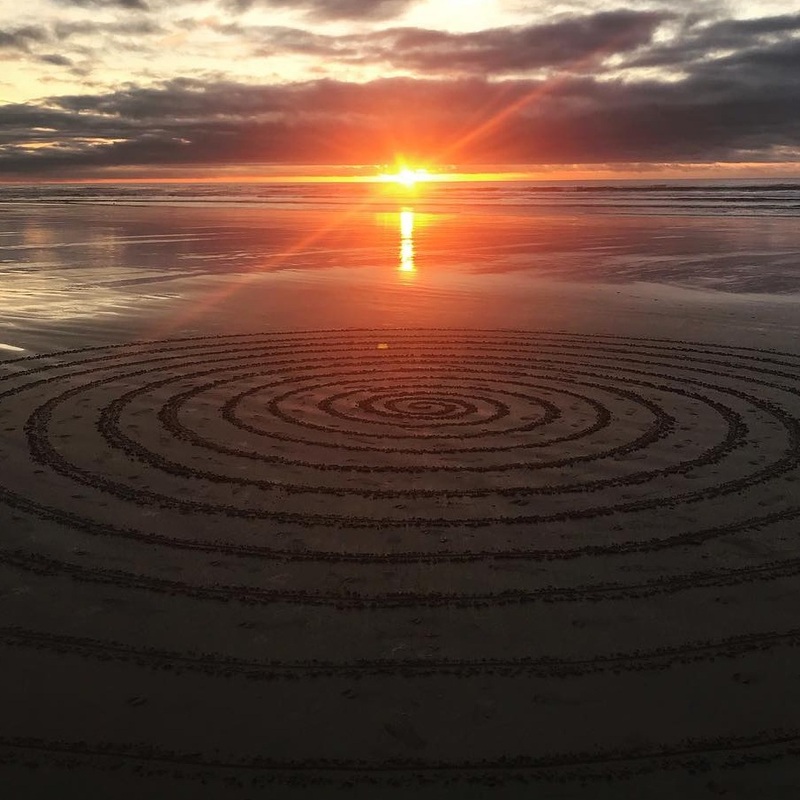 The labyrinth dates back to the Neolithic Age in regions as diverse as Ireland, India, and Greece and served as a symbolic representation of detaching one’s self from one’s present external reality to find some greater meaning within one’s self. Today Easter is celebrated by many different cultures for many different reasons. Christians celebrate the resurrection of Christ. Jews celebrate Passover. Pagans celebrate the Spring Equinox. In Ireland our collective associations with Easter run deep. It is a time when as W.B. Yeats put it ‘All changed, changed utterly / A Terrible beauty is born’. The 1916 Easter Rebellion is now understood as a crucial step in a process that led in 1937, to full independence for most of our island home. One of the 1916 rebel leaders Patrick Pearse merged his nationalism and his devoted Catholic faith and spoke passionately of a ‘blood sacrifice’ that was in some ways inspired by the sacrifice of Christ at Easter. A hundred years on, some view the 1916 Easter Rising as the beginning of the end of the British Empire. The Easter Bunny may well have its origin in the honouring of rabbits in Spring as an animal sacred to the goddess Ostara, much as horses are sacred to the Celtic Epona, and the crow is sacred to The Morrigan. In Celtic mythology and folklore the hare has links to the mysterious Otherworld of the supernatural. The Otherworld (Aos Sí) community was reached through mists, hills, lakes, ponds, wetland areas, caves, ancient burial sites, cairns and mounds. Those entities were seen as very powerful and the hares link to them sent a warning that those who harm them could suffer dreadful consequences. Shape shifters were often said to take the form of the hare. “ The association of rabbits, hares, and the moon can also be found in numerous cultures the world over ranging from Japan to Mexico, from Indonesia to the British Isles. Whereas in Western folklore we refer to the ‘Man in the Moon,’ the ‘Hare (or Rabbit) in the Moon’ is a more familiar symbol in other societies. In Chinese folklore, female hares conceive through the touch of the full moon’s light (without the need of impregnation by the male), or by crossing water by moonlight, or licking moonlight from a male hare’s fur. Figures of hares or white rabbits are commonly found at Chinese Moon Festivals, where they represent longevity, fertility, and the feminine power of yin”. The paschal full moon refers to the ecclesiastical full moon of the northern spring used in the determination of the date of Easter. The name "paschal" is derived from "Pascha", a transliteration of the Aramaic word meaning Passover. Peter Lynch, Emeritus professor at the school of mathematics and statistics, University College Dublin explains the role that Irish scholars played in determining the dates of Easter. In 1984 Eugene Kennedy, then professor of psychology at Loyola University Chicago, published an interview with Joseph Campbell in the Easter Edition of The New York Times Magazine, called “Earthrise - The Dawning of a New Spiritual Awareness.” Campbell talks of the passing from one age to another, of the perils that face our world and of the importance of nurturing a new spiritual awareness. Campbell later wrote to Kennedy, telling him it was that interview that brought Campbell’s work to the attention of Bill Moyers, whose televised interviews put Campbell into the nation’s living rooms. These interviews were watched by millions, and Campbell’s book, The Power of Myth, became a runaway best seller. Which completes the circle for now. In walking the labyrinth of Easter we arrive at a greater understanding of Death, Rebirth and Resurrection. Again we dance with the opposites - The Light and the Dark, The Sun and the Moon, The Hero’s Journey and The Heroine’s Journey which brings me to The Chapel of Ease…..
Our next gathering takes place just before Easter on April 18 at The Chapel of Ease, Irishtown Gospel Hall with host Kathy Scott and guest luminaries Lou Horgan | Yoga Teacher & Creatrix with Sally (Cinnamon) Foran | DJ, Crafter & Storyteller and Fiona Cribben | Artist, Maker & Wellness Practitioner. 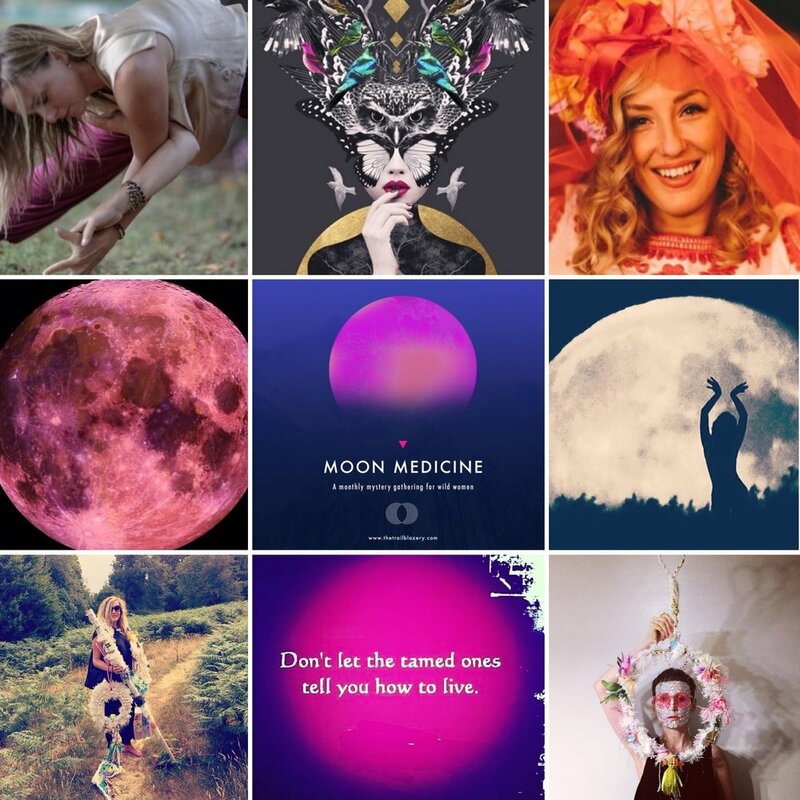 Our Full Moon April gathering weaves a range of potent practices and teachings with musical soundscapes, crafting and conversation to celebrate The Heroine’s Journey. Join us and bring your sisters. For more Moon Medicine information and bookings click here. We look forward to blazing trails with you in the near future.